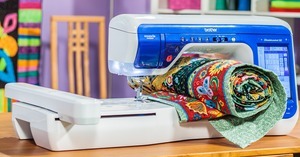 For those who dream of doing it all – sewing, embroidery, quilting and more, Includes 11.25" Long Arm, Pen Pal Control, Laser Straight Stitch Guide, Drop Light Needle Positioning MuVit Rotary Dual Feed Attachment. DreamWeaver™ XE is the exciting mid-priced combination quilting, sewing and embroidery machine, which is downright dreamy – revolutionary technology, reliability, and ease of operation make this the perfect addition to create projects you've always dreamed of, all while adding a touch of sophistication to your sewing room. This exciting combination machine is packed with Brother-exclusive and industry-first features. A chassis gives 5.0'' x 11.25'' of workspace – our biggest work area ever! Featuring 10'' LED lighting for brilliant, full spectrum lighting. With up to 1,050 stitches per minute, you will be creating more works of art in less time. The V-Sonic™ Pen Pal is available for sewing and embroidery. Simply touch the fabric with the sensor pen to place an embroidery pattern or place the needle, setting the stitch width and setting the end point. 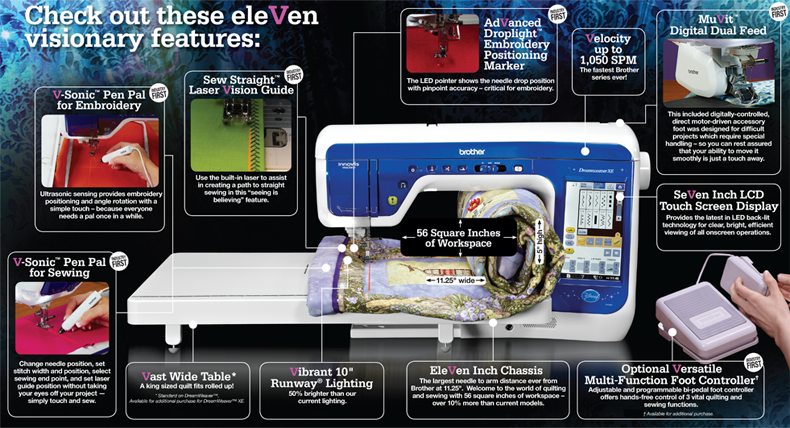 Sew Straight™ Laser Vision Guide makes it easier than ever to sew straight lines. A huge benefit when quilting, piecing, pintucking and aligning rows of stitches. Become a master by watching onscreen tutorials with the large LCD touch screen display which offers vivid, crystal-clear lucidity. If all the industry-first features weren't enough to make your dreams come true, this machine also has many exciting features that customers have come to love like the Automatic Height Adjuster™ AHA® feature and automatic needle threading. Plus, this machine is iBroidery® ready so you have access to thousands of embroidery designs available for purchase. Tackle bigger, bolder projects than you may have ever dreamed of with DreamWeaver™ XE! "Brother’s DreamWeaver XE is the first in a line of sewing machines that adds a variety of features including a laser vision guide to ensure you sew a perfectly straight line, another laser that shows you exactly where the needle will drop in embroidery projects; and an ultrasonic “pen pal” that allows you to control sewing and embroidery functions directly on the sewing bed, rather than on a control screen, It also offers a foot controller, has other features such as an automatic needle threader and an automatic height adjuster to accommodate varying fabric thicknesses, and is one of the largest and fastest home-based sewing machines, sewing at 1,050 stitches per minute." Judges at CES Consumer Electronics Show in Las Vegas, January 2013. "Brother’s DreamWeaver XE is the first in a line of sewing machines that adds a variety of features including a laser vision guide to ensure you sew a perfectly straight line, another laser that shows you exactly where the needle will drop in embroidery projects; and an ultrasonic “pen pal” that allows you to control sewing and embroidery functions directly on the sewing bed, rather than on a control screen, It also offers a foot controller, has other features such as an automatic needle threader and an automatic height adjuster to accommodate varying fabric thicknesses, and is one of the largest and fastest home-based sewing machines, sewing at 1,050 stitches per minute."